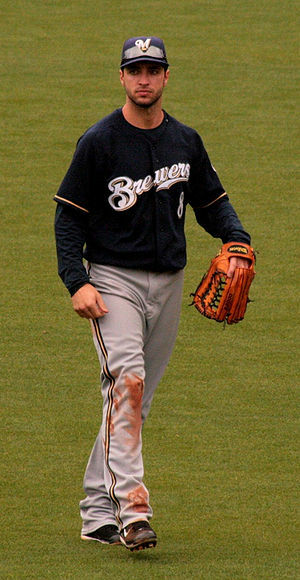 Congratulations to Milwaukee Brewers left fielder Ryan Braun on being named a starter for the All-Star game. Braves third baseman Chipper Jones is replacing Dodgers third baseman Matt Kemp on the NL All-Star roster, meaning Brewers left fielder Ryan Braun will now start in the outfield in Kemp’s place. Braun will be named the starter for the fifth year in a row. Braun had finished fourth in the voting among outfielders, but was selected as a reserve. Jones had been a candidate to be voted onto the team by fans in baseball’s Final Vote campaign. Instead, the 40-year-old Jones is replacing Kemp, who is on the disabled list with a hamstring injury but plans to participate in the All-Star home run derby. via Braun to start All-Star game. Charges announced today as part of an ongoing John Doe investigation. Tim Russell, a longtime Walker campaign and county staffer, was charged with two felonies and one misdemeanor count of embezzlement. Milwaukee County District Attorney John Chisholm said the charges are tied to Operation Freedom, an annual military appreciation day held at the zoo. Also charged Thursday was Brian Pierick, Russell’s longtime partner and a staffer at the state Department of Public Instruction, and Kevin Kavanaugh, Walker’s appointee to the Milwaukee County Veteran Service Commission. The ongoing investigation was initiated by the Walker administration. Chisholm said some of the stolen money was intended for the families of Wisconsin soldiers who were killed in action in Iraq and Afghanistan. Funds also were used for wounded veterans of the war in Iraq. In 2010, Walker’s county administration had asked prosecutors to investigate what had happened to $11,000 raised in 2007 for the event. Chisholm announced the charges at a noon news conference, but said he could not take questions because of the ongoing investigation. He noted that Walker’s administration had asked for the investigation and said his office was following the evidence without regard to politics. “We go where the evidence leads and partisan politics plays no role in any decision by this office,” Chisholm said. Guess that won’t make liberals happy, who were likely hoping that it was Governor Walker who was being investigated. Head over to the source for more details.